Classic vibe with modern refinements. The Squier Classic Vibe Jazz Bass '60s is an electric bass guitar that has all of the deluxe elements its Fender big brother did when first introduced in the 1960s: groovy offset waist design, narrow width, fast-action maple neck with rosewood fingerboard, 2 custom single-coil pickups with Alnico V magnets, individual volume controls that allow you to solo either pickup's sound or blend them for new sounds, and a master tone control for overall tone shaping. The look is Fender all the way - Inca Silver over basswood with a traditional tortoiseshell pickguard with thumb rest. Features include a HiMass bridge with brass barrel saddles, rosewood 20-fret vintage tint gloss maple neck with the modern playability of a 9.5" radius, and vintage-style frets. Tonal versatility and an up front sound - quick and punchy with enough clarity and harmonics to slap and pop. Back in 1982, the very first Squier by Fender guitars and basses came ringing out of Asia. Known for their excellent vintage-quality look, feel, sound and construction, those early Squier instruments and their Fender-branded counterparts are now highly sought-after collector's items revered by guitar enthusiasts as models of getting it right while aiming at value-conscious players. 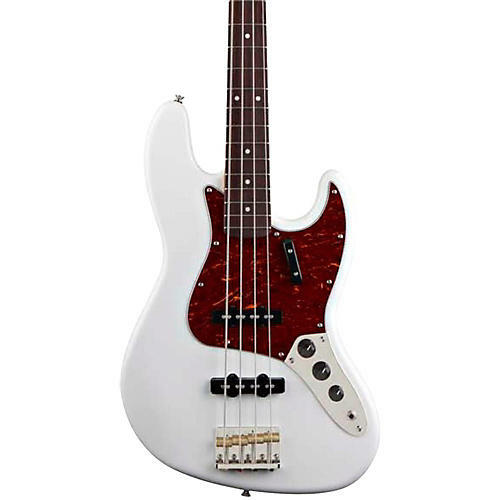 The Squier Classic Vibe Series reflects that simultaneous commitment to excellence, value and 'vibe'. Mirroring classic Fender designs, the Classic Vibe offering is not intended to be era or vintage correct, but rather imparting the 'vibe' of a classic Fender design. Each with distinctive feature set combinations - all adding up to one classic looking instrument. Great sound, vintage looks, unbeatable value ” Classic vibe. Order today!